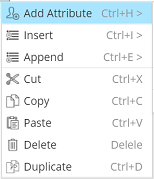 This page explains how to introduce new attributes and control them in a collection tree. 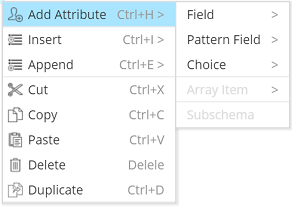 Typically, these attributes are simple fields, but there are other possibilities, as detailed in the Attributes page. Most of the controls below are also available from the ERD view and the Object Browser. 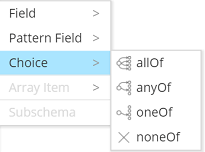 Not all types of fields are allowed to have attributes. Root is allowed to have only attributes as children, no siblings. 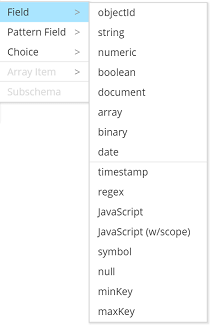 Documents are also allowed to have attributes a and arrays are will have array items. Siblings can be inserted before the selected attribute, at the same level. .
Siblings can be appended at the bottom of the same level. 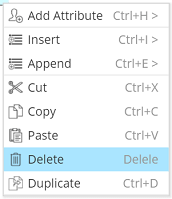 When an attribute is selected, the color of the box is changed to turquoise. 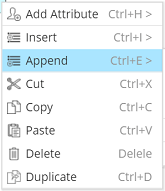 Only available options are activated, depending on the item selected when you perform the right-click. To understand the different types of attributes, you may want to read this page. To change the order of the attributes within a level, use the Move Up or Move Down icons in the toolbar. 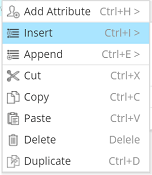 You may also move an attribute with your mouse by selecting the attribute, holding your left mouse button and dragging the box up or down in the same level. 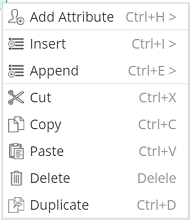 These control have a behavior similar to what is expected in any desktop application. 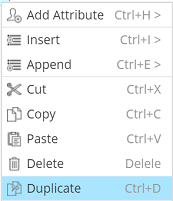 When performing the operation, all the properties of the selected attribute will be copied to a new attribute as a sibling at the same level, including the relationship. Field types include standard JSON Schema field types, plus the BSON types not already in JSON Schema. BSON is a binary serialization format used to store documents and make remote procedure calls in MongoDB. The BSON specification is located here. 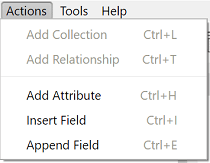 BSON supports the following data types as values in documents. This list varies depending on the database target. You may add references to re-usable objects as explained here. Hackolade supports this MongoDB convention. There are several ways to create a new field. Depending on which attribute you select, you will want to add the new attribute as an attribute, or as a sibling.